Jeremy Radabaugh, founding agent of Radabaugh & Associates in Morgantown, is leading a community charity initiative with the goal of raising support for the Mon County chapter of Habitat for Humanity. 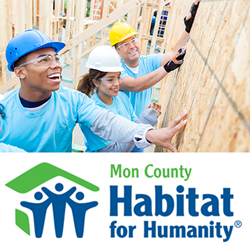 Since 1990, Mon County Habitat for Humanity has completed 52 homes and has provided housing for approximately 185 individuals. “By joining together, we all can have a positive impact on our community and help bring hope to those who have lost it,” said Radabaugh. Efforts to include the local community in the charity drive will include a donation system based on new clients referred into the firm. During the event, for each new person sent into Radabaugh & Associates by a friend or loved one to receive a no obligation insurance appraisal, the firm will issue a $20 donation to Habitat. More information on how to join the Radabaugh team and help support the event is available here: http://insuranceinwv.com/rewards/. As a Personal Insurance Representative in Morgantown, agency owner Jeremy Radabaugh knows many local families. His knowledge and understanding of the people in his community ensures that clients of Radabaugh & Associates are provided with an outstanding level of service. Jeremy and his team look forward to helping families protect the things that are most important – family, home, car and more. Radabaugh & Associates also offers clients a preparation strategy for achieving their financial goals. To contact an expert at Radabaugh & Associates, visit http://insuranceinwv.com/ or call (304) 777-2453.